We all recognize the need—and appreciate the value—of a global workforce, however it is not as easy as it would seem to succeed… especially when cultural differences, time zone challenges, infrastructure challenges and communication styles enter the equation. 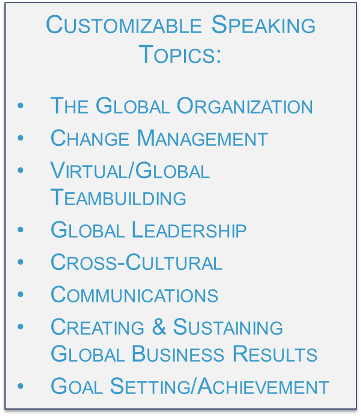 Sheri Mackey, The Global Coach, has a unique perspective on global leadership, intercultural communications and organizational change in the international marketplace. Ms. Mackey is universally characterized by both colleagues and clients as one of the most insightful, powerful and compassionate individuals in global business today. Living and working in diverse countries throughout most of her, Sheri is one of the most knowledgeable and influential global leadership experts in the world and is respected for her exceptional work in international leadership and management. This page provides an overview of what I have to offer, along with a good idea of what you can expect. You can click on the links below to take you directly to the sections that interest you most. If you want to check my availability, or if you have some questions before proceeding further, please email me at info@luminosityglobal.com.